Today we are interviewing Katrina Cope, the author of the preteen spy thriller/sci-fi novel Scarlet's Escape (Book 2 of the Sanctum Series). Jayden & the Mysterious Mountain, Scarlet's Escape, and Taylor's Plight have all been released. Eric & the Black Axes is coming soon. I am a wife and mother of 3 boys, teen and preteen. I have always been a quiet and creative person, but at the same time I love mixing with different cultures and personalities. I have fond memories of reading C.S Lewis and his Narnia series. I also loved reading The Belgariad by David Eddings and Harry Potter by J.K. Rowling. I have been writing for many years privately: however, since I have released Jayden & the Mysterious Mountain, every spare moment has been committed to writing by continuing the series and planing future books. 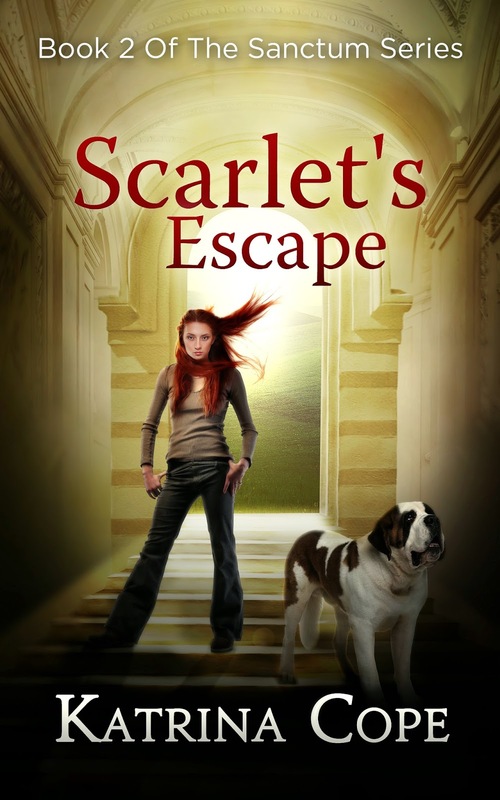 Describe the plot of Scarlet's Escape in a few sentences. It is continuing a year after Avando had rescued Jayden from homelessness. Strange things are happening within The Sanctum, and their movements to fight terrorism are continually being jeopardised. The books are written firstly for 10yr olds, but many adults also enjoy reading them. Anyone who enjoys a little spying, sci-fi, or a book series with twists that keep you thinking. This is the second book in the Sanctum series. Did you do anything differently while writing this book? Book 1 is more of a set up book for the series. It does have action, but not as much as the rest of the series. I made sure this book had more action and this is increased in book 3 Taylor’s Plight. Such a hard question. I love writing all characters, esp. the evil or plotting ones. I enjoy writing Scarlet. She is so feisty, but at the same time loves to have fun. Do you consider fan feedback when writing? For instance, if fans really like a certain character in an earlier book, are you more likely to feature him/her more in the sequel? I love to hear comments from readers about their favourite, or not so favourite characters. Different people connect with different characters. I love hearing what they think may happen or how they would like to see things progress. 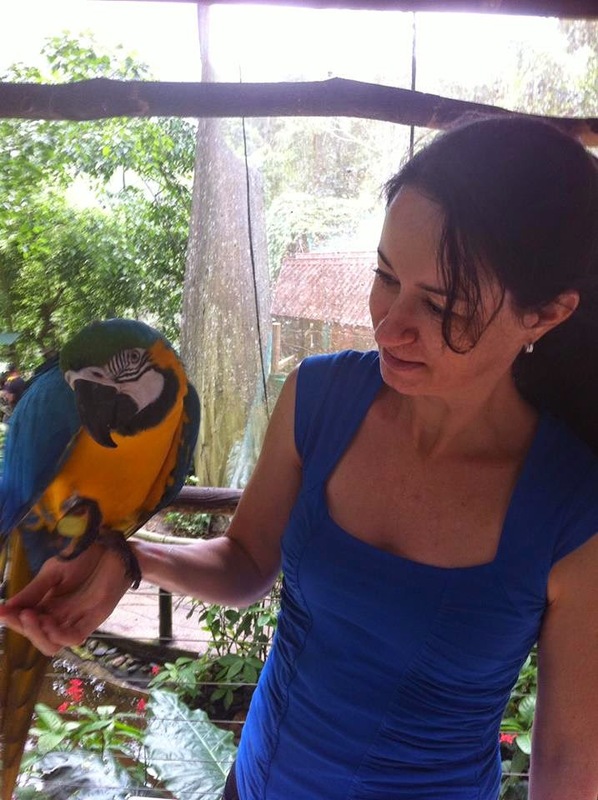 Preteen novel author Katrina Cope with a parrot. How many books will be in the Sanctum series? What made you decide this number? My thoughts are that there will be 5 books in the original Sanctum Series. I decided this when writing book 4. It just felt right to end it with book 5. I have people asking for it to continue more than this, but there are certain outcomes that need to be written in book 5 that I am certain will finish the immediate series. In the near future, I am considering to write an offset series based within the Sanctum, possibly using some or the same main characters. There is so much that can happen that involves this mysterious mountain school operated by a cheeky AI. Without a doubt, I have learnt so much with so much more to learn. I am in the process of completing a certificate in creative writing. I love writing but it is a lot of hard work. Yes. All of it. I don’t think I will ever stop learning to try and improve. Besides doing the course, I make sure I read many different genres, taking in the different writing styles and effectiveness and also what works in storytelling and what doesn’t. I see the benefit of ebooks. I personally enjoy paperbacks more, but I have read many ebooks over the last couple of years and enjoy being able to take many different books with me if I go away. They are great space savers. My goal is to keep writing and publishing many quality books and to keep learning and improving as a writer. I appreciate all feedback from fans. I do have one in particular who has told me his 9 year old son has read and reread my books. The gentleman has trouble reviewing them because he can’t get his eReader off his son to read the books. To me, that is priceless. My immediate family have been very supportive and several friends. My books go through my two oldest sons and my husband first for approval. I now have the problem that my printed manuscript disappears before I have finished writing it. Then I get asked several times for the next book before I have a chance to edit and send the current book to the editor. Editing. I am slowly adapting but it is not my favourite part and takes so long. It is definitely necessary though. I get writers block when I am stressed. It is a matter of getting rid of the stress and allowing yourself to relax and move on. Sometimes it can help to go for a quite walk, exercise or socialise with good friends and having a good laugh. I write with a computer. It is quicker for me. I love the easy editing, and these days, I don’t think I would be able to read my own handwriting. Do you have a project in mind for when you finish the Sanctum series? Yes, I have several. I am currently writing a middle grade book that would appeal to my youngest (lover of all things silly, 9yr old) for my assignment for my course. I may expand on that book as a series later. I also have a few young adult series/trilogies planned. The book and series are different than any other books I have read so far. It has a mixture of humour mixed in with serious issues from society that are battled and sorted out by our young heroes. Sweat trickled down his pale young skin. Down his forehead it travelled, pausing for a brief moment when it hit his eyebrow. It gathered amongst the short hairs, waiting briefly, before continuing as a larger drop to the outside corner of his brow. It resumed down the side of his cheek to the edge of his jaw, making its way to his chin, ultimately dripping directly onto the ground below. It was not that the temperature was hot and humid. Instead, it was because this salty sweat was concocted from the fast flowing blood, pumping through his twelve-year old frame, from the pressure of the job at hand. Jayden glanced over at Aaron to see if he also was showing signs of the pressure. It was dark; however, there was enough light shining on him to see his face. Yes, there it was. He too was showing signs. Aaron was sweating as much, if not more, from the intensity of the task at hand. They had previously been running for about five minutes so that they could arrive as quickly as possible at their destination. Now they were sussing it out from a safe distance, watching for any activity that could be threatening to them. In front of them stood a small village that looked like a little army camp, perhaps containing rebel soldiers. They had been given strict orders to check the place out and destroy any type of weaponry they came across. These orders were easy to follow, as this place had been marked as an extreme threat, in the form of terrorism against innocent people. Jayden placed his back firmly against the trunk of a rather large tree on the opposite side from the village. Aaron watched him intently and followed suit, trying desperately to blend as much as possible into their surroundings. Aaron was a spectacular fighter in Tae Kwon Do, one of the best that Jayden knew of, especially at his age. However, at the moment, Aaron was paying particular attention to Jayden’s actions. It was discovered soon after Jayden joined the group at The Sanctum that he was extremely gifted both at camouflage and blending into his environment. This had been revealed purely by accident, when they had played a game of skirmish in the trees outside their school building. Jayden had succeeded so well that they couldn’t even see his tracking light on the computer tracker. It had been a little over a year since Jayden had taken Avando’s offer and joined the group at The Sanctum, leaving behind the harsh life on the streets. Although he would have been happy with an ordinary, caring home, he was astonished when he was taken to live in a school called The Sanctum, which was built within a large mountain. This mountain was not only truly amazing, but it was decorated with marble, had the best views which were likely to be seen only in a travel catalogue and it was eco friendly too. It was also equipped with a really smart computer or artificial intelligence called Scarlet. She was super intelligent; even hilarious at times and not to be crossed. There were significant consequences in that and all played out by her. Jayden peeked around the back of the tree, looking attentively for any movement. He thought he saw something on one of the outside corners in the shadows. His heart immediately pumped extra blood through his body in anticipation of a possible enemy who might be moving around in the dark. Aaron’s face grew a worried look under the crop of his dark brown hair. He indicated for Jayden’s attention to be zoned into the movement he had observed. Jayden nodded in acknowledgement, crouched down, and crept his way over to the edge of the trees for a closer look. Aaron followed closely behind him, making use of the magnifying advantage of binocular vision Jayden zoomed in his sight towards the moving shadow. He saw an external garbage bin located in that corner and from the side of this, he saw the movement again. Realising that the movement was from something small and furry, he put it down to being a cat or some other foraging animal. He breathed purposefully in a slow repetitive manner, letting his heartbeat settle down with the realisation that it was only a creature of the night. Moving his attention to other parts of the village, he scouted the area again without seeing some sign of any other movement. He spoke into the mouthpiece of his roving communicator strapped to his head, “Seraph?” it being another name for a messenger or an angel. “Copy!” the quick, friendly response from Robert’s distant voice instantly soothed their nerves a little, as they knew that they were not totally alone. “We’re in need of some better eyes,” Jayden requested to him. “Not a problem! Clearer vision is coming your way,” Robert affirmed. Jayden and Aaron waited quietly while continuing to watch the village ahead. It seemed like a pretty sleepy village at the moment. A couple of lights shone dimly lighting up the main street area. At present that seemed like the only signs of occupation, besides the stray creature feasting off the full garbage bins. It wasn’t long before Jayden felt a fluttering on the coat of his camouflage uniform. He looked down to see an insect crawling out of one of his pockets. It was black with beady eyes and long transparent wings with conspicuous veins. He recognised it as he had seen it in the trees around The Sanctum. It was a Cicada. Once it had finished crawling out of his pocket, it seemed to be looking straight at Jayden and started to sing like it was trying to tell him something. It then flew over to Aaron and landed on his chest and also stared into his eyes. After singing a little Cicada song, it flew off and landed back on Jayden’s chest and once again stared back into his eyes. “Ahh … Seraph? Is that you?” Jayden asked hesitantly through his roving communicator. Thankful that it wasn’t just some weird, eye staring insect, Jayden breathed a sigh of relief. It looked just like the real thing. Robert’s inventions never ceased to amaze him. He was a whiz with all technology and all sorts of amazing gadgets, yet he was only twelve. Talk about a prodigy! It wouldn’t be noticeable when you look at him though, especially after seeing him eat. He really loves his food but, unfortunately, lacks all kinds of manners, including hygiene. With Robert, that all seems to fly out the door when food is involved. Jayden shivered feeling repulsed just thinking about it. The Cicada flew off into the air and headed towards the village. In the corner of his night vision glasses, Jayden noticed another small screen appear. It seemed to be bouncing all over the place. Trying not to get motion sick, he looked intently at the screen. Once he focused, Jayden realised that it was actually the vision from the eyes on Robert’s cicada. It flew around the closest buildings first, pausing on the windows while taking a good look inside. The cicada must have had night vision installed, as it could even see clearly inside the windows where there were no lights. Proceeding with caution, Jayden started making his way closer towards the edge of the trees. He moved slowly, purposely trying to continue to blend in with his surroundings, just in case some impending threat had been overlooked. Aaron continued following Jayden’s example though, at the same time, keeping an eye out for any danger. A loud hoot sounded in the tree not far from where they had stopped. They both jumped at the noise and then looked at each other and smiled, having a silent laugh at their edginess, once they had realised that it was only an owl. Progressing forward, they reached the edge of the trees, dropped to their stomachs and started to crawl, commando style, towards the first outside building of the village. With all senses on full alert, they proceeded while continuing to keep an eye on the screen from the cicada’s vision. Limb by limb they crawled closer to the first building. They were almost there when they noticed that the cicada had come across a room full of people dressed in army camouflage uniforms.